Experts feel that this yellow spice has benefits beyond one's imagination. 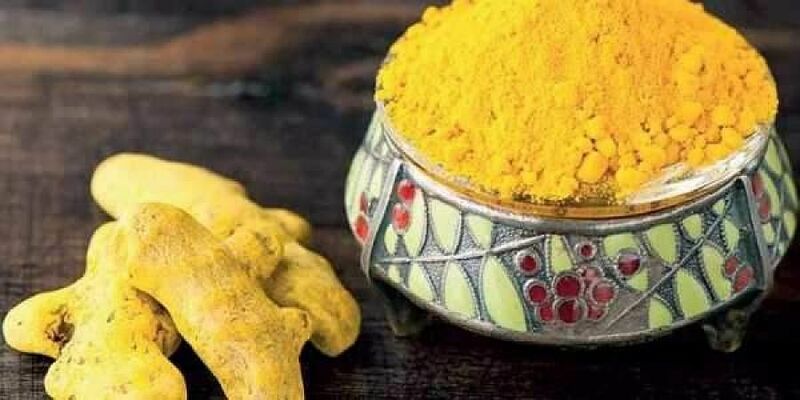 This yellow spice has benefits beyond one's imagination, feel experts. De-pigmentation: Application of turmeric with honey and lemon on the face for 20 minutes clears blemishes and reduces hyper-pigmentation. A paste of turmeric powder, triphala and chandana mixed with rose water acts as a natural defoliator and removes hyper-pigmentation marks from the body. Apply this paste thrice a week before bathing. For de-tanning, boil coconut oil with two rhizomes of turmeric powder. Daily application of this restores natural glow of the skin. Cures acne: Due to its anti-bacterial properties, turmeric is very effective in treatment and prevention of acne. It helps in destroying the acne causing bacteria, while also removing excess oil from the skin. Application of paste of turmeric, sariva (hemidesmus indicus), manjistha chandan (ruba cordifolia), yashtimadhu (liquorice) and neem over the face for half an hour clears blocked skin pores, improves facial blood circulation and prevents acne. Lighten skin: Turmeric is popularly used to successfully lighten the skin. A lightening face mask can be made by mixing turmeric with lemon juice. The natural skin-bleaching properties of lemon and the anti-oxidant properties of turmeric make it a powerful boosting combination. Cracked heels: Possessing great healing properties, turmeric can be used to soften heels. Application of aloe vera pulp with a pinch of turmeric over the heels soothes burning sensation of soles and heals cracked soles. For smooth heels, add a few drops of turmeric oil in 2 table spoons of coconut or castor oil and apply it over cracked heels every night. Reduces stretch marks: Apply a paste of turmeric powder with khadir and triphala, mixed with almond oil three to four times a week before bathing. This helps in reducing stretch marks, reduces laxity of skin and tones the skin. Prevents wrinkles: Turmeric prevents reduction in skin elasticity caused due to chronic UVB exposure. It helps in healing and also slows the ageing process, keeping the skin supple and diminishing wrinkles. Apply a paste of turmeric powder mixed with yogurt. Rinse with water thoroughly after 20 minutes. Use this mask thrice a week for one month to notice an evident enhancement in your skin.